It was exactly an year ago, when entire universe was hustling for bullish cryptocurrencies sentiments when BTCUSD was trading all-time highs nearing $20k mark. But for now, the price sentiment of bitcoin has absolutely been indecisive as the price action near the crucial resistance of $4,130 could encourage renewed selling or the prospects of a continued rally would stimulate sharply if prices close above $3,934 or the stiff resistance levels. Following the declines in cryptocurrency values in November and early December, please be noted the decline in Bitcoin mining activity also as the corresponding profitability collapsed (F&L, Dec 14), following a significant increase during 2018 boosted by improvements in technology. After a modest recovery in prices in the second half of December, mining activity recovered somewhat (refer 1stchart). The actual market price and our estimate of the intrinsic value of Bitcoin are shown in (refer 2ndchart),and the ratio of price to intrinsic value is shown in 3rdchart. Similar to the results of Hayes (2018), we find that the sharp spike in Bitcoin prices during 4Q’17 saw a significant overshoot of the market price relative to intrinsic value based on the cost of production approach, which then corrected as the rise in prices saw an increase in mining activity and as the market price subsequently declined. Indeed, the market price peaked at just below $20,000 in mid-December 2017, while our intrinsic value estimate peaked at around $9,100 in early March 2018 by which time the market price had converged to this level. We refer to JP Morgan as they followed a methodology adopted by Hayes (2018), which first estimates the daily cost of production as a function of the computational power employed, cost of electricity, and energy efficiency of hardware. It then divides the daily cost of production by the number of bitcoins that can be produced daily to get a marginal cost of production per Bitcoin. 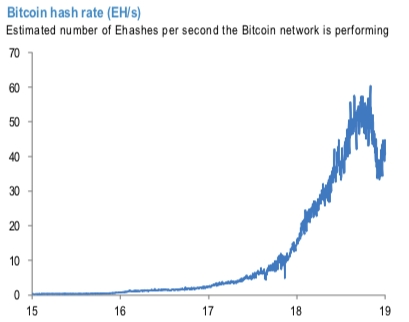 In order to estimate this marginal cost of production for Bitcoin at an aggregate level, we use daily data on market price, hash rate and difficulty from bitinfocharts.com, and use the assumptions employed by Hayes (2018) on efficiency of mining hardware and electricity costs ($0.135 per kWh) up to February 2018 (latest data provided in the appendix of the paper). We then use assumptions used in the Bitcoin Electricity Consumption Index allowing for a gradual increase in efficiency and decline in electricity cost (to $0.05 per kWh). Currency Strength Index: FxWirePro's hourly BTC spot index is flashing at 47 levels (which is bullish), hourly USD spot index was at -180 (bearish) while articulating at (04:29 GMT).